This cathedral is named “Saint Mary of the Sea”, located in the district El Born and a fine example of Catalan-Gothic architecture. It was built in only 54 years, between 1329 and 1383, and two architects were in charge - Berenguer de Montagut (designer of the building) and Ramon Despuig. This church, which is actually a basilica, is dedicated to the Virgin Mary and was funded and built by the poorest people in Barcelona – the sailors and the fishermans. On their days off they were carrying big stones on their backs from the mountain Montjuic (LINK to Montjuic text later), which is 2 km away, to this place, where Santa Maria del Mar is standing now. As a reminder of this hard work, there are two bronze figures above the Cathedral’s main entrance in Plaza de Santa Maria del Mar. The fascination of the church depends on many reasons. Exterior and interior give a different sensation: the main entrance side consists of a traditional Catalan-Gothic facade, with a predominance of horizontal lines and large bare surfaces. Apart from that different colors were used for the windows in the different sides of the cathedral – at the front, where the sun is rising, the stained glass in the windows consists of earth tones, red, orange, brown and greens. These colors were being used for representing the Mediterranean land. On the sides of the cathedral the windows are more blue and white, which represents the Mediterranean sea. 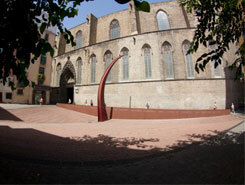 In 1428 the church suffered some damage: an earthquake of 8.0 magnitude struck Barcelona and the big round window at the main façade fell into Plaza de Santa Maria del Mar. It happened while a celebration took place there in the crowded square and 30 people died. 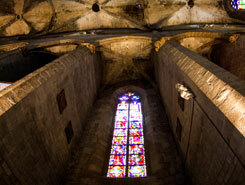 Apart from that the cathedral burned several times – the last time while the Franco regime and the Civil War in 1936. 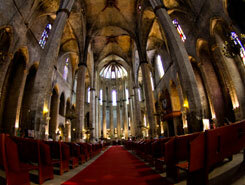 The Santa Maria del Mar was set on fire and burned 11 days in a row. This fire damage call still be seen in the inside of the church’s ceilings.